The nation’s third-largest carrier, Sprint Nextel, yesterday reported third-quarter earnings and their CEO Dan Hesse opined “iPhone is worth every penny”. We learned they pay a 40 percent higher subsidy to Apple than the industry average, amounting to $200 more per device. In a conference call with analysts, Hesse said “iPhone users are likely to consume significantly less 3G than the typical user of a dual-mode 3G/4G device”, Barron’s reports. Was the iPhone’s 50 percent lower data consumption the reason why Sprint agreed to reportedly pay $20 billion for 30.5 million iPhone units? The publication quoted BTIG Research who speculate that if Sprint’s claims are true, “this could become a new key differentiator in Apple’s relationship with the operators that subsidize versus its competitors HTC, Samsung, Motorola, etc.” How does iPhone save data on the Sprint network? The truth is, we don’t know yet. Optimization on the network end tailored specifically to Apple’s handset is one possibility. Hesse’s comment might also stem from a glitch causing slow data speeds for iPhone 4S owners on their network. Also don’t forget the Apple-advertised twofold speed increase with the iPhone 4S only applies to GSM 14.4Mbps HSDPA networks, meaning AT&T in the United States. Both Verizon and Sprint iPhone 4S continues to be limited to the slower CDMA 3G EVDO radio technology. Verizon is rolling out first-generation 4G LTE network in select cities (Sprint will begin a 4G LTE roll out in 2012) so 4G LTE Android phones on Verizon likely consume more data compared to Sprint’s iPhone 4S that runs on their 3G EVDO network which is noticeably slower than either 4G LTE or AT&T’s 3G HSDPA network. Obviously well-aware that Android people consume more mobile data than iOS, Google introduced new mobile data usage controls in Android 4.0 code-named Ice Cream Sandwich. 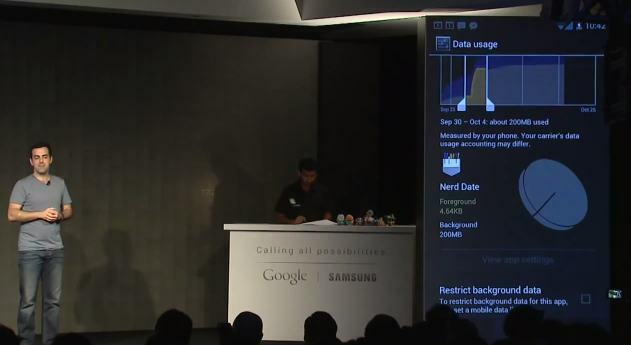 At the October 18 unveiling of Ice Cream Sandwich and Samsung’s Galaxy Nexus smartphone, they touched on the new controls in the Android software. As seen in the below screenshot, you can set warnings when a particular threshold is crossed, see a projection of your future usage based on your history and – most importantly – specify limit for automatically cutting off all mobile data. Now, disregarding the geekiness of the user interface for managing your data consumption in Android, one could only wish for the most basic controls in iOS. Smartphones use a lot of data, it’s a fact of life. Monitoring cellular data usage is paramount for those on tiered data plans. It would be nice if Apple allowed its users to see an overview of data consumption on a per-app or activity basis and set data thresholds. While iOS lets you check cellular usage in Settings > General > Usage > Cellular Usage, this is a far cry from understanding your data usage and having the controls to better manage it. Apple, you listening?